Have you ever been “in the zone,” where projects felt almost effortless? If you’ve ever experienced this, you were in a state of Flow. This term was coined by Mihaly Csikszentmihalyi in his seminal work Flow: The Psychology of Optimal Experience. 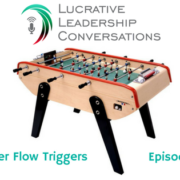 Flow triggers can be a powerful ally for anyone in leadership. 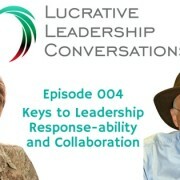 Welcome back to the Lucrative Leadership Conversation podcast. 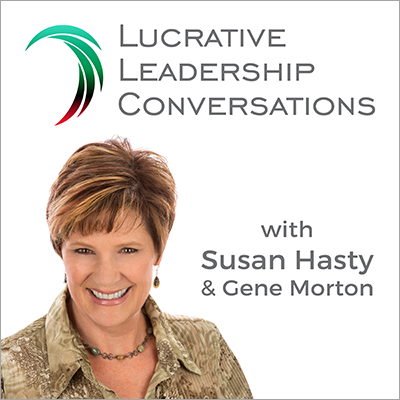 In season 1 of the podcast, we have covered the “6 Bold Steps” Gene Morton has developed that allow organizations to become both profitable and sustainable. Today, we discuss how to implement a successful performance tracking system and how it is worth your time and energy. The 6 Bold Steps provide a strategic pathway for leadership teams to achieve clarity, focus, accountability, and commitment within their organizations. In step 1, leaders agree to their own personal responsibilities to ensure decisions protect the organization’s best interest. In step 2, they craft a common language, which we call “outcomes, that expresses the core competencies synergistic with the strategic vision. In step 3, they negotiate who, on the leadership team, will have the primary accountability for designing and executing each outcome. In step 4, Working together, the leaders begin an intuitive process to collaborate and design a structure they are able to support and explain to others. Leaders decide their roles for each outcome and agree how and when communications occur that define future and past actions and decisions. They create the first drafts of the reporting structure. In step 5, leaders finish designing a strategic reporting structure. Engaging the entire organization in ongoing discussions improves the design. Conversations serve to clarify and reinforce the meaning of the outcomes that make the organization sustainable. Most performance management systems focuses conversations on past results. Failure is a part of the learning and improving process. You cannot hold people accountable for what they cannot control. Don’t waste energy holding them accountable. It’s too late. Correct the situation and work on determining those accountabilities up front and know who is in charge of what. In the last episode of the Lucrative Leadership Conversations podcast (you can listen here), Gene and I discussed how leaders undergo a creative process to design a new reporting structure design. Traditional Reporting structures typically show the individual titles held by the leadership team members. As a result, this default model, in effect, inhibits collaboration and reinforces “silo” based decisions, behaviors and results. Oops, a audio technical meltdown ruined Gene and my recording. We made a promise to provide our listeners with a weekly show so I was sweating earlier this week. 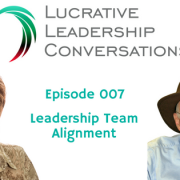 Coincidentally, I was a guest on LODGING LEADERS Podcast, hosted by Jonathan Albano, recently. Jon saved the day for me, suggesting I share it. Great idea. I get to share his podcast and solutions with you also. Do a quick search for “business failure” and in less than half a second, Google will return more than 10 million results. You read that right. Ten million. Failure in business is a major concern. Putting in the hard work of creating and sustaining leadership accountability is a priority every company must achieve to survive. Welcome back to the Lucrative Leadership Conversations podcast! 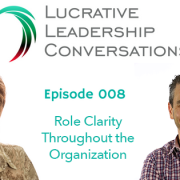 Over the past two episodes, we have discussed how leaders can master change by leveraging their conversations to impact others within the organization. Today, we look at one of the most critical decisions of effective leadership: Creating foundational business outcomes.